# Preheat oven to 180c. # Dust beef with 2 Tbsp of the plain flour. Heat a pan until very hot then add a little oil and cook the beef in batches until the outside develops a deep caramel crust. Remove from the pan and set aside. # Reduce the heat to medium and add a little more oil. Add the onions and carrots. Saute for 2 mins, stirring, then add the garlic, bay leaves, thyme, remaining 2 Tbsp flour, and tomato paste and cook for 1 min. # Return the meat to the pan, then pour in the Guinness, stock and Worcestershire sauce and bring to the boil. Place in the oven and cook partially covered for about 1 1/2 to 2 hours until the beef is tender and gravy reduced. If it’s looking at risk of burning, stir in 1/2 cup of water. Check every so often and give it a stir. When cooked, adjust the seasoning and set aside to cool. # Add the flour and butter to the bowl of a processor and pulse until they just come together (any more than this will melt the butter and overwork the flour). # Add the water, a third at a time until you get a dough that is not sticky but holds together when you press it compact in your palm. # Turn out onto a lightly floured board and bring together to form one ball of dough. Refrigerate until firm. Note: This will make more pastry than is needed in this recipe. Wrap what’s left over in plastic wrap and place in a snap lock bag and place in freezer. If time permits, make both the filling and pastry the day before you want it. Put cooled filling into a plastic container and place in the fridge until needed. Pastry can be left wrapped in plastic in the fridge too. About 1 hour before starting to assemble the pies, remove the pastry ball from the fridge and put to one side. # Roll out the pastry to 2 – 3 mm thickness. Cut circles that are larger than the pie tin and line them. If the pastry was made the day before they hopefully shouldn’t shrink, but if you have just made the pastry then leave some excess overhanging to allow for shrinkage. Refrigerate for a couple of hours until firm. # Trim the pastry and blind bake for approx 15 mins. 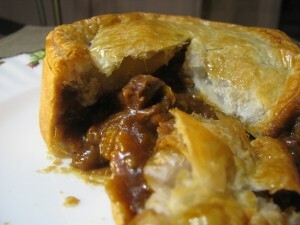 Remove the pie weights etc, fill with meat mixture and brush the rim with beaten egg. Place a circle of puff pastry on top, pressing at the edges to seal. Cut a slit in the middle of the pie. Brush the top with the beaten egg and place on a baking tray in the oven and cook for approx 25 mins or until well risen and golden. The exact time will depend on the size of your tins.